By denying public health workers their legally-mandated benefits, the Aquino government has practically reduced their monthly take-home pay. MANILA – Government hospital workers are grappling today with demoralization as they confront a “state policy” that results in reduction of their hard-won benefits, decimation of the ranks of regularly employed public health workers, and cutbacks in free services for the poor. At present, the lack of plantilla positions for health workers has been compelling some public health personnel – from doctors to nurses and other health practitioners – to work duties that last from 16 to 24 hours. In the last two decades, the plantilla position for nurses, for example, has remained unchanged, despite the increase in the population during the same period. Leaders of the health workers’ alliance shared that a public health worker today is losing P860 (US$ 20.23) per month since the Department of Health (DOH) implemented its Order No. 2012-002. 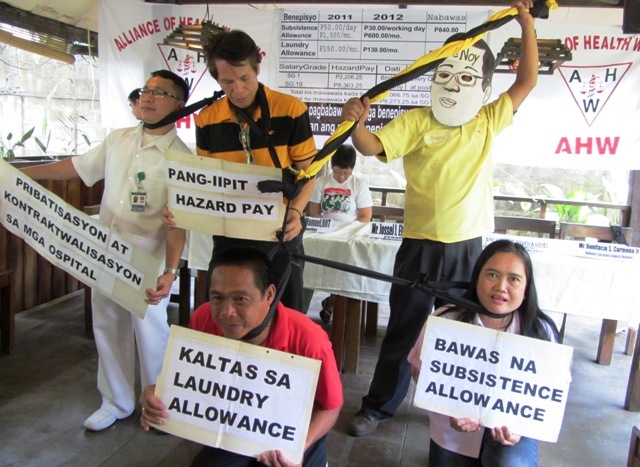 The order, which was released last January 11, reduces their laundry allowance from P150 ($3.53) a month to P130 ($3.06), and subsistence allowance from P50 ($1.18) per day to P30 ($0.71) per working day. The cut was based on the General Appropriations Act of 2012, which, the health workers said, also centralizes to the Department of Budget and Management (DBM) the fund for unfilled plantilla positions and requires agencies to get prior approval from the DBM before it could release its savings and allocate it for the benefits of its personnel. The management of public hospitals source from their savings the benefits of health workers, such as hazard pay. With the DOH and DBM order, this hazard pay is now being delayed, or worse, at risk of not being given to health workers at all, said the AHW. President Benigno Aquino III is doing something that even former president Gloria Macapagal-Arroyo did not dare to do during her unpopular rule, according to the health alliance. Had the act of impeaching Chief Justice (CJ) Renato Corona been verified and further debated in the committee and plenary instead of the 188 lawmakers inordinately rushing the articles of impeachment to the Senate, the House as a whole would have seen the constitutional defect under which the accused is being removed from office. There is no excuse here for the breach because all members of the House took a solemn oath and affirmation to support and protect the Constitution and therefore it is assumed that they knew in advance that the impeachment of Corona begins and ends with the Constitution. A majority of Americans would back a US strike against Iran if given evidence that Tehran was building nuclear weapons, even if it led to a surge in fuel prices. ­A Reuters/Ipsos poll showed Tuesday that 56 per cent of Americans would support US military action against Iran if it was proven that the country had a nuclear weapons program underway, while 39 nine per cent of Americans were against military intervention. A Siberian research institute has joined forces with the world’s most controversial geneticist to clone the woolly mammoth – a species that has been extinct for thousands of years. ­Vasily Vasilyev, vice rector of North-Eastern Federal University of the Sakha Republic and Hwang Woo-Suk of South Korea's Sooam Biotech Research Foundation have signed an agreement, and say they hope to produce a living mammoth within six years. The union is no accident. Yahoo has kicked off the biggest patent battle in social networking history by suing Facebook over 10 patents. Facebook pledged to defend itself forcefully amid speculation Yahoo is trying new ways to raise funds as its ship is sinking. The Yahoo Inc. lawsuit filed Monday covers advertising, privacy controls and social networking. The move comes after the former web giant threatened to sue Facebook last month, saying it would seek licensing fees from the social network over the use of its patents.Yahoo also said other companies have already agreed to such licensing deals. Taiwan has joined rival China in protesting a Philippine plan to conduct oil and gas exploration near the contested South China Sea where it is also claiming sovereignty. According to Taiwan’s foreign ministry, Manila is accepting bids for an oil and gas exploration in the Reed Bank or referred to as Recto Bank by the Philippines. The lawyers of Chief Justice Corona succeeded yesterday in further demolishing pieces of evidence used to back the impeachment charges against Corona while at the same time fortifying arguments that the House prosecution panel used leaked confidential information from key government agencies in preparing its case against the Supreme Court (SC) head. The second witness for the defense belied Internal Revenue Commissioner Kim Henares’ earlier testimony before the court that Corona did not file his income tax returns (ITRs) from 2002 to 2005. Detained ex-President and now Pampanga Rep. Gloria Arroyo has been ordered arrested by the Sandiganbayan yesterday in connection with the aborted $329-million national broadband network (NBN) deal with Chinese firm Zhong Xing Telecommunications Inc (ZTE) in 2007. Included in the arrest order issued by the anti-graft court were her husband Jose Miguel, ex-Commission on Elections chairman Benjamin Abalos and former Transportation and Communications Secretary Leandro Mendoza. Informed about the arrest warrant, Ferdinand Topacio, the Arroyo couple’s counsel, hurriedly went to the Sandiganbayan office and posted bail for the former First Gentleman. The Department of Justice (DoJ) yesterday ordered the filing of murder charges against former Palawan Gov. Mario Joel Reyes, his brother, Mayor Mario Reyes Jr., and three others in connection with the killing of broadcaster Gerry “Doc” Ortega in January last year. In a 28-page resolution approved by Prosecutor-General Claro Arellano, the justice department also recommended the filing of murder charges before the trial court against former Palawan Provincial Administrator Romeo Seratubias, Reyes’ close-in security Arturo Regalado and Valentin Lecias. Interior and Local Government Sec. Jesse Robredo has cited Tagum City for its Care for School Chairs Program which converts confiscated illegal logs into armchairs, desks and tables for public schools in the city. In his recent visit to, Robredo was in Compostela Valley as guest of honor during the 14th Araw ng Compostela Valley where 260 school chairs were turned over to the Manat National High School in the municipality of Nabunturan. Customs officials at the Ninoy Aquino Interrnational Airport (NAIA) arrested an African woman who tried to smuggle into the country 2.7 kilograms of methamphetamine hydrochloride or shabu. Airport Customs deputy district collector Thess Roque identified the African passenger as Aicha Camara, 27, and a native of the Republic of Guinea who arrived in the country last Sunday night. The health condition of detained former Maguindanao Gov. Andal Ampatuan Sr., one of the principal suspects in the gruesome 2009 Maguindanao massacre, has not improved during his confinement at the Armed Forces of the Philippines (AFP) Medical Center in Quezon City. At a press briefing yesterday, AFP spokesman Col. Arnulfo Marcelo Burgos Jr. said while Ampatuan’s condition has not deteriorated for the past 24 hours, it also has not improved.